I'm loving this thread! the 'quickly quickly' command isn't used with a frantic voice, we still speak to them in a calm voice, but it seems the fast pace of the syllables seem to help them understand they can't stop in the middle of the road. Having two when you're out alone can be quite a lot of responsibility. When there's only one of us, we only take them as far as the back garden and even then, you have to be constantly alert because one will normally go one way and the other in the opposite direction so neighbours looking out to the back garden will see one cat on each end of the garden with me in the middle with both arms outstretched, looking back and forth like I'm watching a tennis match We will only take the two of them out further when the two of us are free to take them out, even in the car. Will keep all the tips shared so far in mind for our wigwam trip and hope for the best and post photos when we get back and hopefully share any other useful tips we might get out of it! 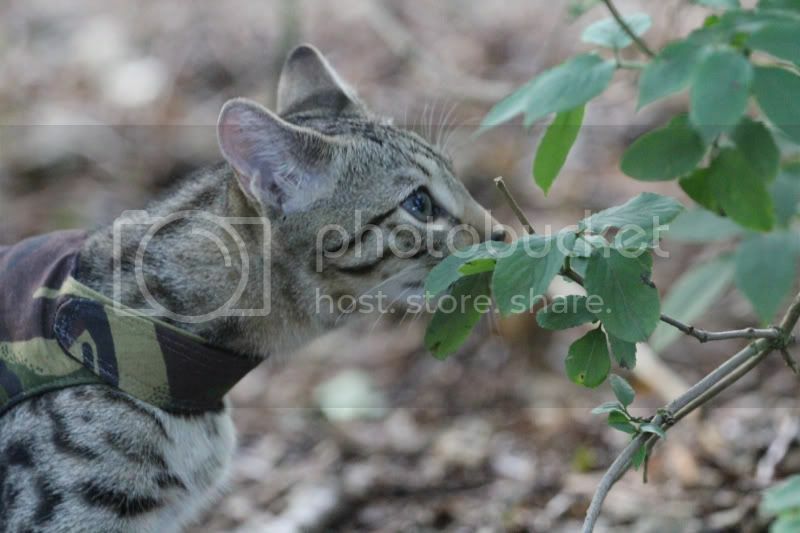 One question: I noticed there are 2 loc8tor tags in the same package, would it be possible to use one tag on each cat or would I need to buy 2 tags? Also, because we don't use collars on Tigger and Nala, OH posed the question: the only times they break free would be if they backed out of their jacket when it gets caught on something, otherwise if the lead was dropped and they ran off, wouldn't we be going after them anyway, especially with their pet safety lights? So his question was, since the loc8tor tags are tucked into their jackets and if they escaped without their jackets on, it wouldn't help find their location, what is the point in having the tags put in? I wasn't sure how to answer that question any experiences or advice to share? Firstly this thread is brilliant!!! 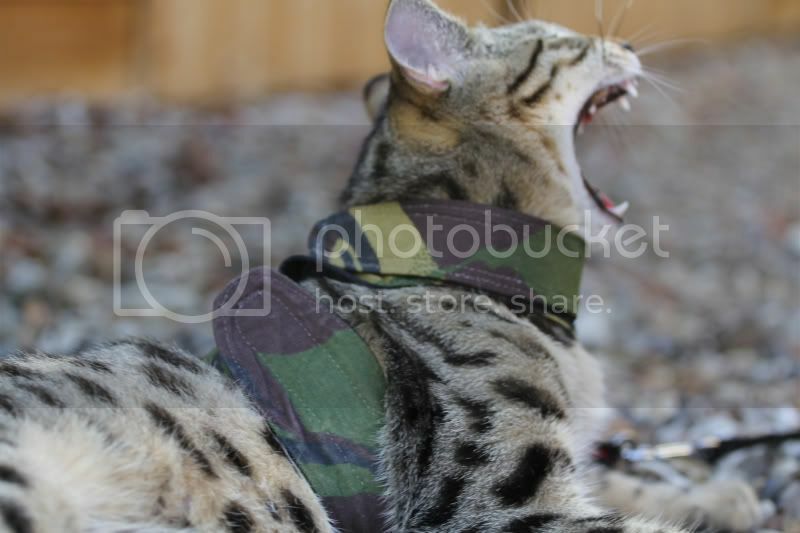 Thanks to viperkeeper, and everyone else for sharing your stories and pictures! Making sure my boy gets to explore and experience the great outdoors safely is very important to me. Eric loves his time outside and will ask daily to go into the garden. Its still very early days, and I hope one day Eric and I have enough trust he could maybe walk without a lead, although his love of climbing could make this tricky, but anyhow, I will share our experiences so far. (I have shared some of these pics before, but they go nicely here). I started walking Eric and 14 weeks, I've had both his jackets made by Mynwood Walking jackets, are have been brilliant. The velcro is very tough and they have never let us down. I then started walking him around the back of my house (pretty fields) and eventually the big, bad woods, his favourite! And actually the easiest, for some reason, Eric loves walking through the woods but needs persuasion in open land, he must like the cover of the woods. My friends have accompanied me before on an Eric walk and have expected something similar to walking a dog, this is not the case. Eric will run in short bursts, stroll slowly and he likes sniffing time. He also takes time for laying about and he loves CLIMBING! He will randomly run up trees all the time. He never goes higher than my husband can reach, but he always can get himself back down. 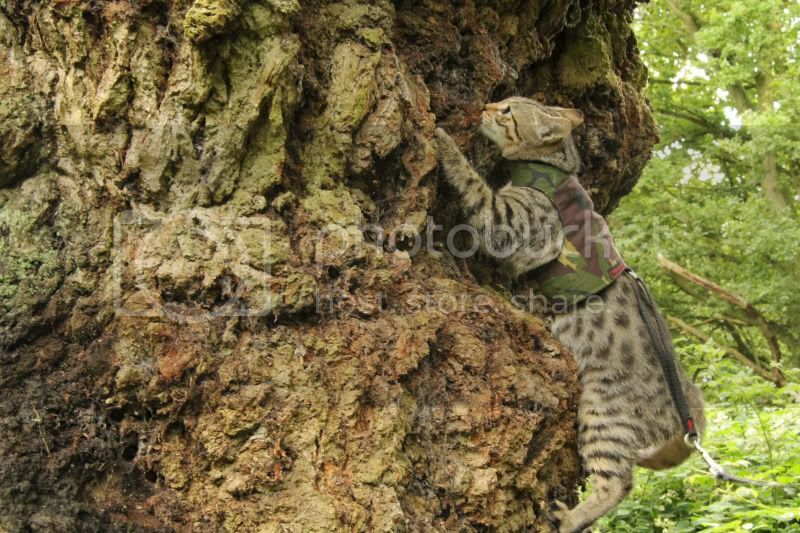 There was a time when I accidentally let go of the lead and he darted up this tree pretty high, Eric decided he would just chill there, so my husband did some climbing himself. 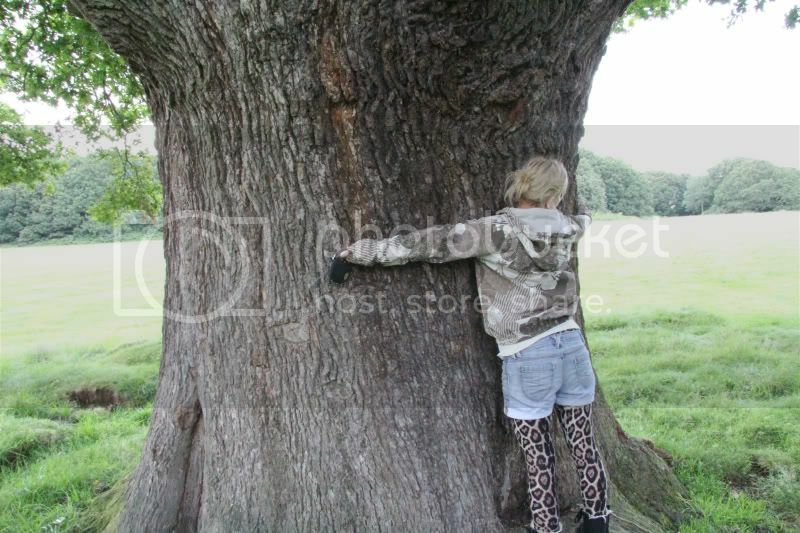 Luckily the trees are chunky and easy enough to climb. I hold the lead very tight now!!! I think the climbing is a really important way for Eric to exercise and good for his claws, but I do have to keep a close eye on him. When Eric decides he doesn't want to walk anymore I use a donkey / carrot approach and use a long piece of grass or wiggly stick acts the carrot! 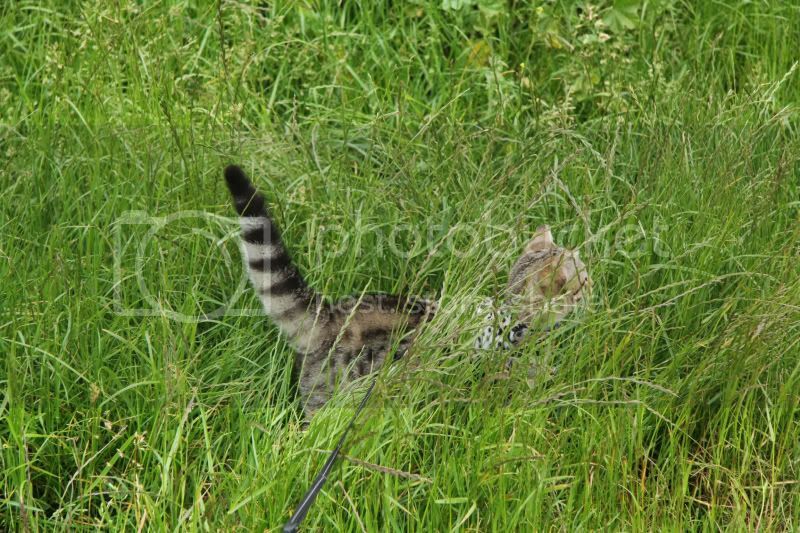 Wiggling the grass on the ground whilst walking gives Eric something to follow and gets him moving again as does throwing a stick. Its like fetch but he hasn't yet mastered the 'fetch' part of the game, just the running towards the stick! Still it works. The thing that worries me most is dogs. We do bump into lots of dog owners on our walks. I would like Eric to not be phased by them, but he gets instant busy tail!! Most owners are lovely, want to chat and put the pooch on a lead. Others tut at me and let their dog continue to run. In which case, i just pick Eric up. Not sure thats the best option, and not sure how this will work as he gets older as he is already getting quite heavy! Any advice here? In the car Eric either rides on my lap in the front if the husband is driving, or i clip his lead to a seat belt with a caribeaner (not sure how you spell that) He seems to like the car journeys and looks out of the windows. On the way home he normally kips on the back seat!!! 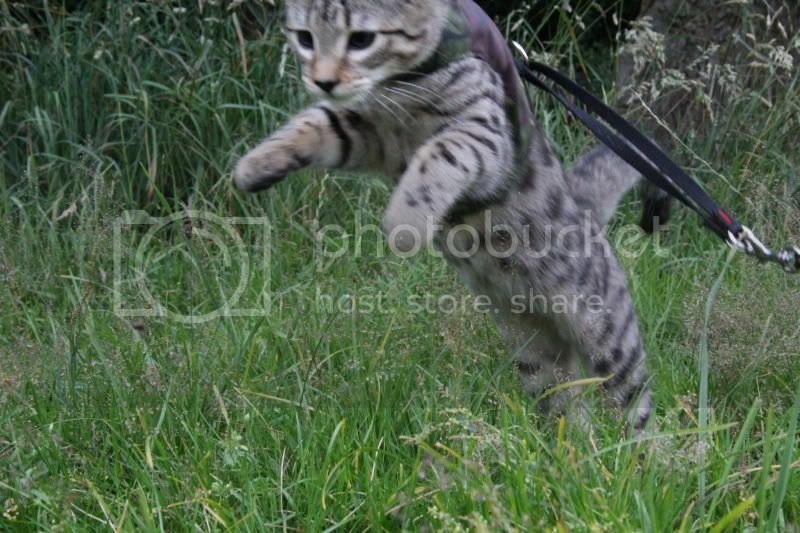 So overall I love walking my cat and more importantly I feel he really benefits from it, fresh air, exercise, being at one with nature and quality bonding away from the house with me. Eric is a handful at times but when it comes to getting his jacket on he sits on my lap perfectly still. When he wants to go out he will sit and the door and miow, I either take him in the garden or walk with him when he asks. He also also very well behaved when we return as he is usually worn out!! Yet to do camping, but this is something we will be doing this summer and I will update you all on how it went. If you look at the picture of the hand unit (looks like a credit card) there's 4 buttons on it just press the button and that's the tag it finds. Up to 4 tags so one kit could do 2 cats it also includes 2 holders for a collar and 2 pendulum holders if you prefer that or for your keys or something. I disabled the speaker and led on one of my tags so he doesn't know when I'm looking for him. 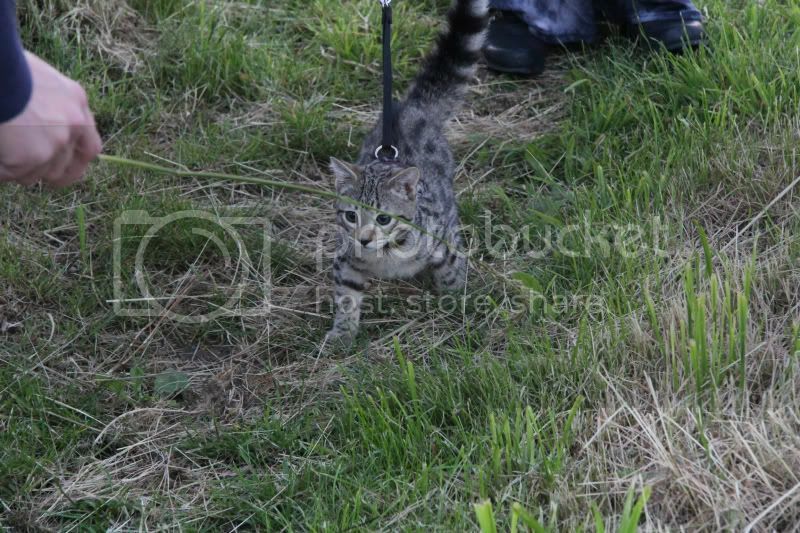 Best of Pouncey click HERE the ORIGINAL Kamping Kitty! Parrissnpo, could you explain "caravaning" I only think of it meaning driving in a large group. Bummer about it being canceled. I like the beach pic besides the thumb the color schema of the cat, jacket, rocks sand everything together looks very frame able hint-hint. I don't understand why there's guide dogs or why people would want to hurt them. Is it part of the caravan? When Pouncey is scared I kneel down and he runs up to my shoulder. RabbitREW mentioned how Pouncey does this but its not trained just a natural reaction like "climbing OH's leg" when he's scared and on the leash I calmly kneel tap my shoulder and call his name, then stand up. Spent ages trying to find a pic of our caravan to show you, had a great time lhunting through pics & seeing how much the kids have grown up in the last year. Anyway I couldn't find one of the caravan we have now so here's a pic of the one we had before, new one is a bit bigger & more suited to 4 people 1 dog & 2 cats. I was just having a rant about guide dogs for the blind being attacked by some idiots dogs. I don't know anyone its happened to just something I heard on the radio, which then had me fretting that if people let their dogs attack a blind person's guide dog then they would probably let it attack a cat on a lead So I'm a bit more concerned now about going anywhere where there could be dogs. Am a bit of a worrier! how would I protect cats & kids if the worst did happen. As someone else said some people put their dogs onto the lead when they see you but others don't bother. Last time we were out there was a huge Weimaraner (bigger than St Bernard we used to have) charging up & down the beach, they didn't call it back or anything even when we got closer. It frightened me never mind Tino, he was inside my jacket hidden, just to be on the safe side. I think a lot of dog owners just think "my dog won't do anything" so just leave them running free, they don't think about the feelings/reactions of other people with cats/kids/horses or other dogs. My OH is a prime example he doesn't put our silly dog back on her lead when there's anything near he just lets her continue running about. She probably wouldn't chase anything, but you don't know how another dog/cat/horse/person will react to her. 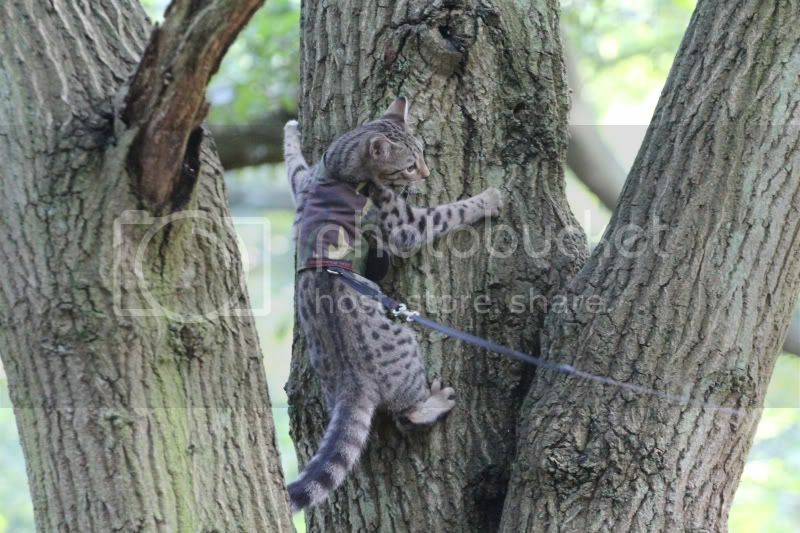 neoow, thanks for the compliments any chance of seeing Pixel and Widget in the great outdoors? Pixel and Widget are indoors only at the moment, I'm afraid, so I didn't have much to contribute to this thread. 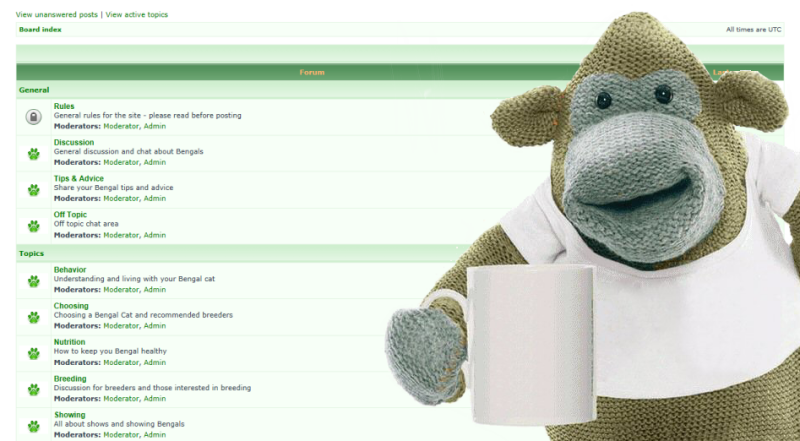 I keep checking back though because I find it useful for ideas. 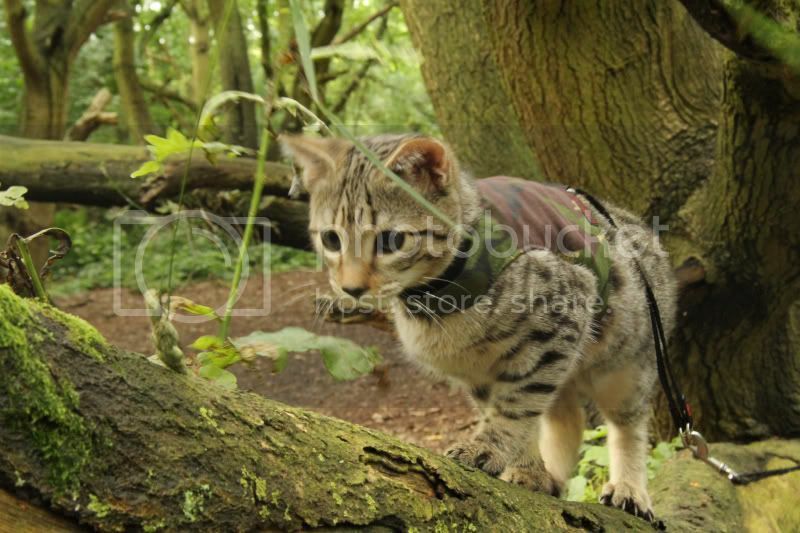 Have been contemplating cat walking jackets for a while but haven't had the spare money for two jackets and leads as I'm on a tight budget each month. Not sure how well my two would adapt though. Pixel can be pretty skittish when spooked and Widget absolutely hated his collar when we tried them. Would sit and scrab at it the whole time. Pixel used to be distracted by the barrel (which had our names and address rolled up inside) and treated it like a plaything which was on her neck haha. 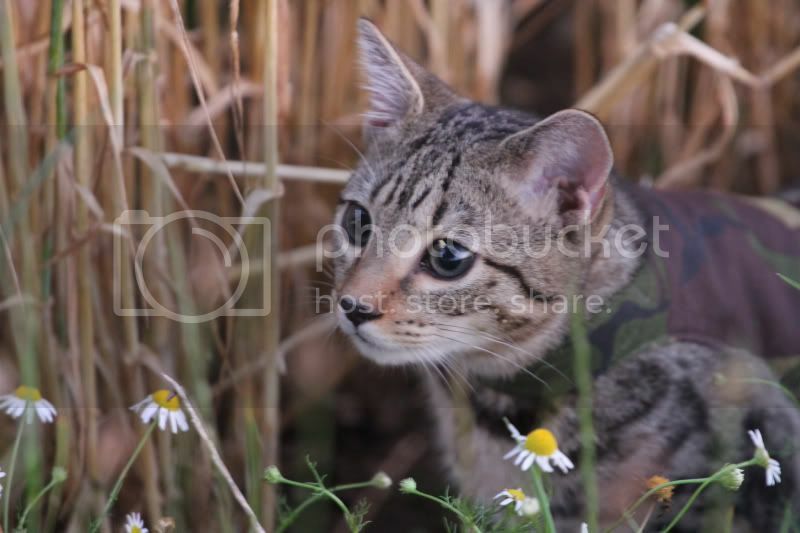 PhelanVelvel, sorry if I was harsh I really would like you to contribute on how you and your cat get along outside as its not the normal way most walk their cats AFAIK we're the only two. It's fine, I just wanted to say that in my experience, it's not dangerous to let them off the leash if they're trained to do so and it's in a safe area. I know it's not what most people do, but I think more people COULD do it safely and with good results IF they have the right training and surroundings. I'm not saying it's right for everyone, but I didn't want to say that it's always a terrible idea, either. Sorry for detracting from your thread. It's just my style, my rabbit was allowed to roam free in the backyard as well (supervised) and he never left our property. 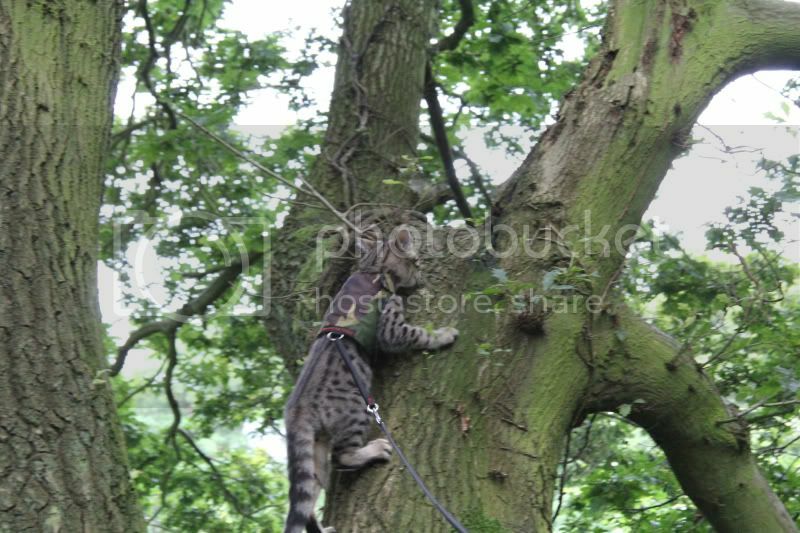 I don't think that our cats are being put in danger just because we don't have them tethered. It's an alternative, and I don't see it as a dangerous alternative. Plenty of people go places with their dogs off the lead, and people don't usually call that dangerous, even though it's implied that it would be dangerous if you were walking with them on the side of a highway or something. 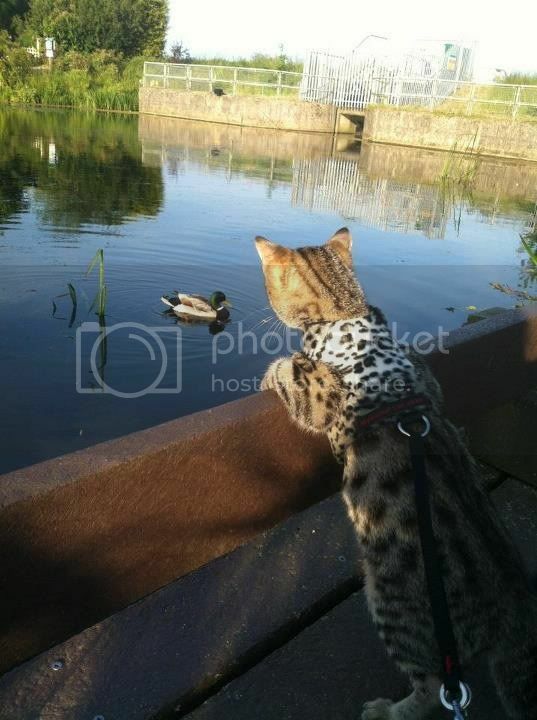 I was just putting in my two cents and advocating the leash-free style of spending time with your bengal outdoors. My apologies. 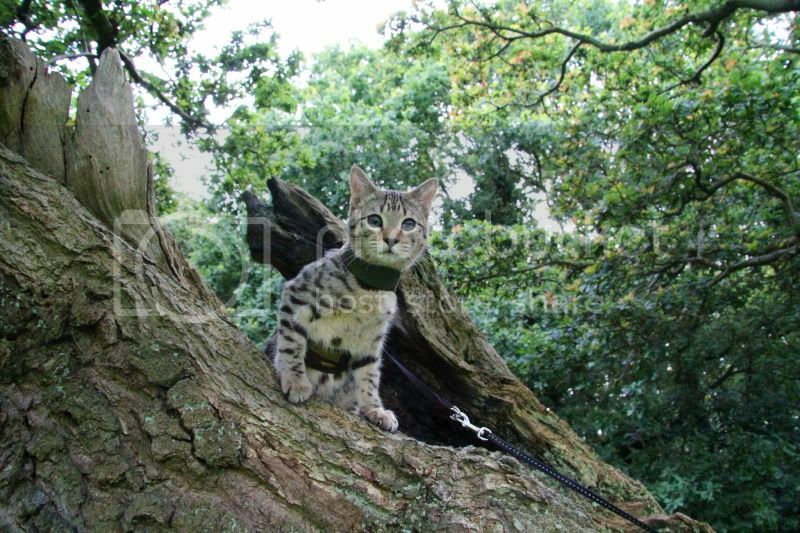 I don't think that our cats are being put in danger just because we don't have them tethered. It's an alternative, and I don't see it as a dangerous alternative. Plenty of people go places with their dogs off the lead, and people don't usually call that dangerous, even though it's implied that it would be dangerous if you were walking with them on the side of a highway or something. Great read. Would love to take mugen out fishing with me. I move about during the day just night in the tent. 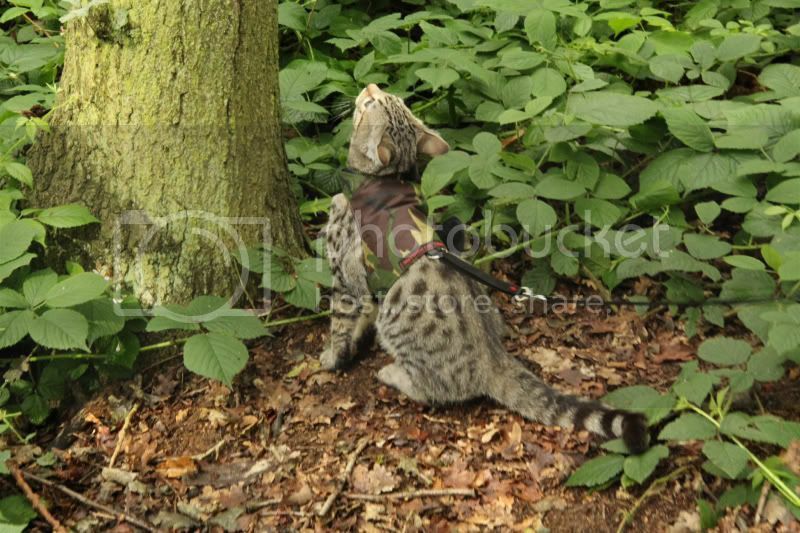 But it's a wonderful place to walk him once I have a new cat harness and have got him used to it. I'm sure there's different types of fishing and I'm not trying to discourage you I think its great to try. If someone asked me to go fishing I'd definitely bring my cat. My experience with fishing is its very boring for me. There's so much to do and explore I'd think your cat would have a fit sitting there. Try it share your experience you have my interest. Haha great picture. Yes well once he used to being around the lake I might try it but for now just the back garden. As partner comes aswell so can always go for a wander. Plenty of mice about during the night that try to get in the bivvy I'm sure that will give him plenty to do. I know some of you feed raw and have to change it up for camping or travel. Found these freeze dried raw nuggets and thought they could be a good option. They even come in individual pouches like the ones Viperkeepers uses for Pouncey. Just add warm water to rehydrate and serve. We have tried these with Max but he is by far the PICKIEST cat ever and had nothing to do with them. Our other cats seemed to like it. Anyone tried them? PS- love the posts and pics being shared! I also have a new flashlight or two on my Christmas/Birthday WishList. Last edited by RabbitREW on Fri Aug 17, 2012 5:04 am, edited 1 time in total.